Ilana and I are sitting in the car on the way to Swansea… we’ve had a very ‘challenging’ week (as one of my good friends would say!). In fact, the way I’ve been describing my week is ‘horrid, horrendous, horrid’. My mum fractured her pelvis (yet again! ), and has been in great pain in hospital. My adorable Lab pup Archie is still not fully well after his hospital visit, and to cap it all off, there have been some real struggles at work. All this said, during my six-week meditation course with the wonderful Mita Shah, she spoke about how we as humans tend to label events as ‘good’ or ‘bad’. We attach judgements to occurrences… my troubles are ‘a disaster’, instead of ‘something I am capable of fixing’; my mum’s accident is ‘bad luck’ as opposed to ‘something she is recovering from far more quickly than last time’. There is also always the option of not labelling things at all – and just accepting things for what they are, without judgement. So, with this in mind, I’ve desperately tried this week to address my thoughts and associated labels – and stop using the words ‘horrid’ and ‘horrendous’, and instead simply accepting. Ilana has described to me in the past about her ‘Coca-Cola Bottle’ analogy. Each piece of adversity or difficulty in your life adds Coca-Cola to your bottle. And then, as yet another thing is added, the bottle begins to fizz over – and you’ve lost control. And so, Ilana and I found ourselves chatting about how every tiny thing that goes wrong at the moment is causing my Coca-Cola bottle to overflow. As the week’s events mounted up – from my mobile phone breaking, to Archie eating my iPad, to finally, just dropping some food on the floor – I felt like I may just snap. She explained that if we put the little things that are gradually filling up our Coca-Cola bottle into perspective, and think differently about each situation, the amount of Coca-Cola decreases. Archie eating my iPad… a happy puppy being cheeky and caught before harm was done. My phone breaking… finally an end to the mobile that has been hard to use for a very long time, and an excuse to get a shiny, new one. Ilana suggested that it’s about turning things on their head so that you can see them from a positive perspective rather than a negative one. Indeed, this is something that psychologist and neuroscientist, Professor Elaine Fox, discusses at great length. She says that we each have a natural bias towards positively or negatively looking at a situation… and most importantly, this bias can be changed to lean towards the positive. What’s more, authors and positive psychologists Fred Bryant and Joseph Veroff found participants who were encouraged to maintain a positive focus during daily walks for one week reported a greater increase in happiness at the end of the week, compared to participants who were encouraged to maintain a negative or neutral focus during their walks. 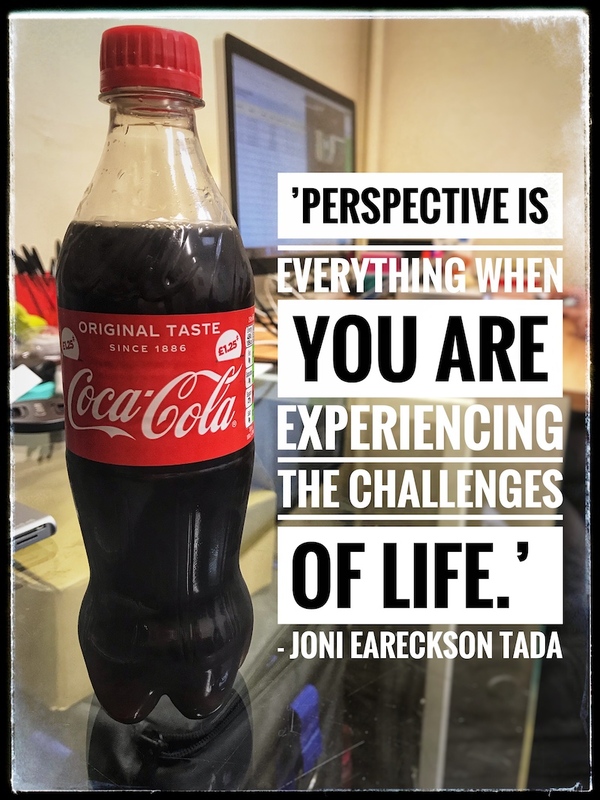 But how do you get that positive perspective when you are in the moment and you feel your Coca-Cola is about to overflow? And ideally how do you detach yourself from the drama of a situation? For me, there are a handful of things. I know that meditation is key. It allows me to gain that distance, and re-centre myself amongst what feels like chaos. I’ve also learned that my personal strategies are to get 8 hours sleep and to eat 3 healthy meals per day. Next on my list, is speaking to a wise friend, someone who comes from a place of centred-ness and non-drama. For example, this week, in the space of an hour with a friend and wise mentor I was able to reframe my entire perspective. Yes, it takes lots of practice to do this, but each time you sit down to reframe, it becomes easier and easier. And finally, getting away. Be it jumping in the car for 20 minutes, taking a walk away from the hospital, or just removing myself from the triggers of the upset, I can begin to re-shape my perspective. For Ilana, it’s gratitude. By taking a step back and thinking about her happy, healthy family, appreciating her healthy body that enables her to build strength (and get into funny positions in yoga… it was headstands this week! ), and the knowledge that she has people around her to support her through anything she might be facing. Like me, she also finds it important to discuss things through – usually with her mum on long country walks. And all this enables her to appreciate the positive, shrinking down the negative thoughts with the knowledge that there is plenty of good that far overrides the bad. And this is key – the positives in life often out-way the negatives and focusing our perspective on these holds great power in making us happy. In the context of my mum, I have experienced some lovely acts of kindness over the past week – from a friend offering to stay with her overnight, to a waitress I had never met in a coffee shop giving me complimentary cake and wishing my mum better! So Hubbers, it’s all about perspective. Recognising your patterns of negative thinking is the first stage, and how you are labelling events. And then taking steps to change your thoughts… and slowly, but surely, the things in your Coca-Cola bottle will get smaller and smaller, until they disappear from it all together.